If you want really good banana baked goods, whether muffins, cupcakes or bread, overcoming any squeamishness towards overripe bananas is a must. That is the key to the flavor. And when I say overripe, I mean over-ripe. Like black overripe. Like need-to-pick-up-bananas-with-latex-gloves-and-throw-in-the-incinerator overripe. If you look at the picture below, those are overripe bananas. But they’re not even as overripe as the ones I actually smashed in the bowl. Almost, but not quite. The ones I used were totally black all over – no trace of yellow left. THAT’S what I mean by the perfect overripe bananas for the perfect banana baked goods! So, before you make this recipe, allow those babies to ripen! 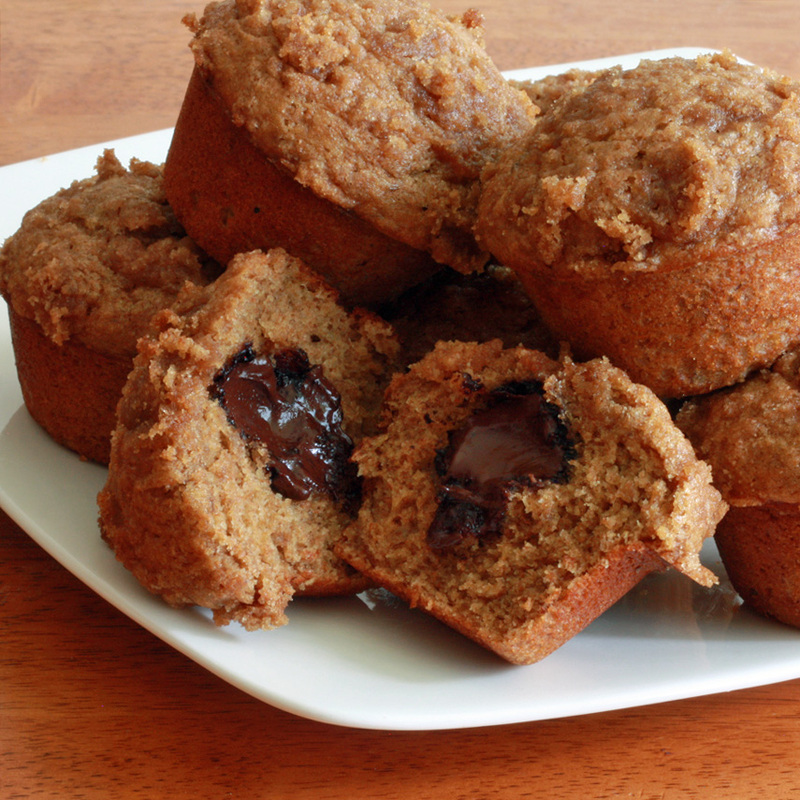 You’re going to love these muffins. 100% whole wheat for a healthier alternative, but still perfectly light and sensuously moist. The cup of buttermilk accounts in large part for the moistness. The acid in the buttermilk adds moisture to the wheat while allowing you to cut back on fattening oils. Buttermilk is low in fat, it’s taste is barely discernible in the final baked product, and it contributes to a beautifully tender and light crumb. 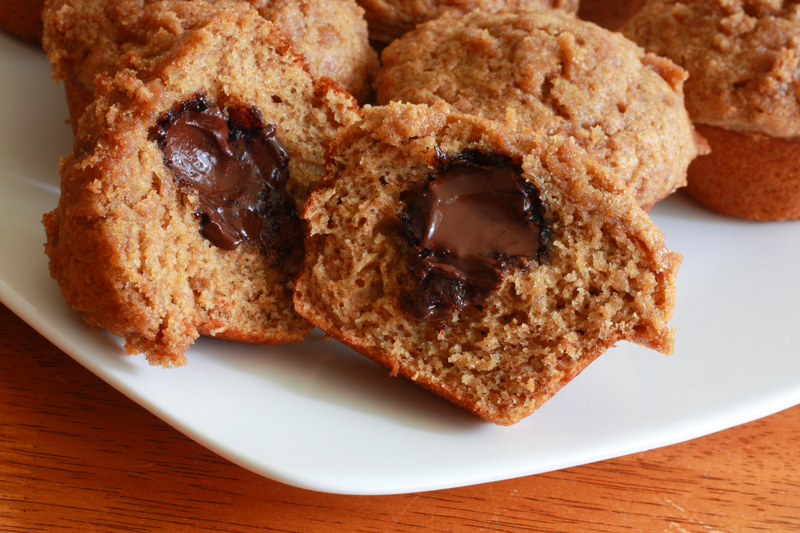 The muffins are filled with your choice of chocolate truffles or a scoop of Nutella. I used both in making these today – half and half. I had chocolate truffles left over from Christmas (still have waaaaay too many left for my own good! ), and let’s get real – I wasn’t about to pass up the opportunity of making some with Nutella! (One of my ultimate weaknesses). Lastly, these muffins are topped with a delicious crumbly streusel. Mash the bananas to equal one full cup. Combine the flour, baking soda, baking powder, and salt in a small bowl. Combine the bananas, oil, eggs, brown sugar, and vanilla extract in a large bowl. Using an electric mixer, beat the wet ingredients. Once combined, add the buttermilk and beat for another minute. Gently fold in the flour mixture into the wet mixture in 3 batches. Stir just until combined (careful not to over-stir or the muffins will be dense). Place all of the crumb topping ingredients in a small bowl. 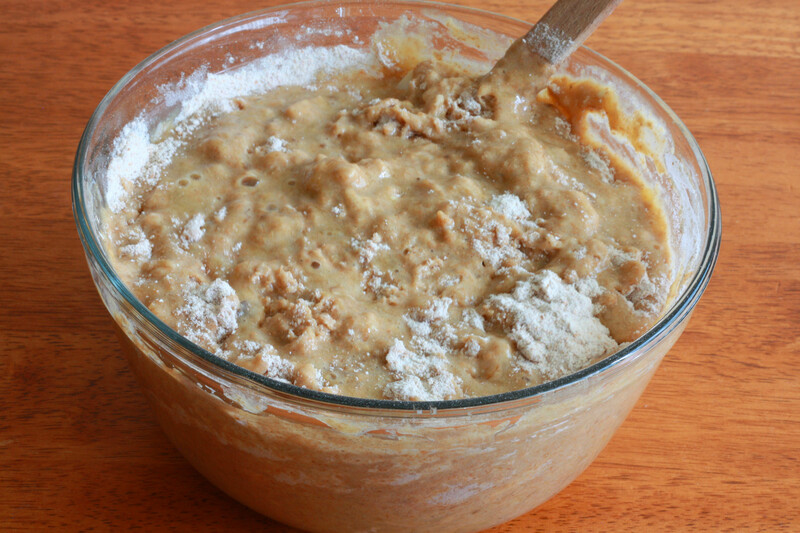 Using your fingertips, combine the ingredients until the mixture resembles coarse wet sand. Spray a muffin pan with vegetable oil spray and fill the tins halfway full with the batter. Place the chocolate truffles or 1 teaspoon of Nutella in the center. Cover with more batter until the muffin tins are just over 3/4 full. Evenly sprinkle the crumb topping over the muffin batter. Preheat the oven to 375 F. Bake the muffins for 16-18 minutes or until a toothpick inserted into the middle of the muffin comes out clean. Allow the muffins to cool in the muffin pan for 5 minutes before removing and then place them on a wire rack to cool. To make the crumb topping, place all ingredients in a small bowl and use your fingers to combine until the mixture resembles coarse wet sand. Evenly sprinkle the crumb topping over each muffin. Beat all wet ingredients in separate large bowl, adding and beating the buttermilk last. Carefully fold in the flour in 3 batches just until combined. Spray muffin pans with vegetable spray. Fill half full with the batter, put either one truffle in the center or 1 teaspoon Nutella. Add more batter on top to fill the muffin tin to just a little over 3/4 full. Bake for 16-18 minutes or until a toothpick inserted into the center comes out clean. Place the muffin pan on a cooling rack and allow it to cool for 5 minutes before removing the muffins.